last year, for the first time in my life, i felt anti-semitism. it was the worst feeling and i decided that the best way to counteract prejudice or anti-semitism is to educate. so, this is the first in a series of posts i will write and share about hanukkah between now and when it begins on december 8th. the most important thing that i can begin with is that hanukkah and christmas have absolutely nothing to do with each other. there are none of the same traditions. it is not founded on the same foundation nor the same meaning. the fact that they often fall at the same time, is just coincidence. 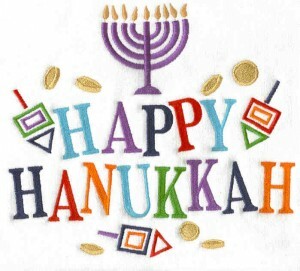 hanukkah is the jewish festival of lights. the hebrew word hanukkah means dedication. you may see hanukkah written hannuka or chanukah, when writing a hebrew word in english there is no correct or incorrect transliteration. the holiday begins on the eve of the 25th day of the hebrew month of kislev and lasts eight days. this year it begins on saturday, december 8th and the last candle will be lit on saturday, december 15th. some years it coincides with christmas and other years like next year, it will start the night before thanksgiving. (ugh). the Hebrew calendar (הלוח העברי ha’luach ha’ivri), or jewish calendar, is a lunisolar calendar used today for jewish religious observances, which is different from the christian calendar. therefore, holidays are at a “different” time each year. also, often on a christian calendar, you will see a jewish holiday written somewhat incorrectly, for example, if you look on your calendar today, you’ll see that it shows that hanukkah starts on sunday, december 9th. that is incorrect. all jewish holidays begin at sundown the night before and last until sundown generally 8-days later. so yes, december 9th, WILL be the first FULL day of hanukkah, but, the holiday itself begins the night before at sundown. the first candle is lit on december 8th. the books of the maccabees tell the story of hanukkah which occurred in 165 B.C. after three years of struggle, the jews in judea defeated the syrian tyrant antiochus. the jewish people held festivities in the temple of jerusalem, and rededicated it to God. After removing all syrian idols from the temple, the jews found only one small cruse of oil which to light their holy lamps. miraculously, the cruse provided oil for eight days. judas maccabaeus, the jewish leader, then proclaimed a festival to be observed by jews. the festival of lights. hanukkah. 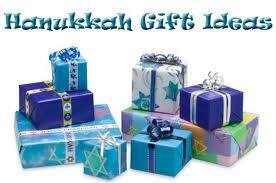 in current times, during hanukkah, gifts are exchanged and contributions are made to the poor. 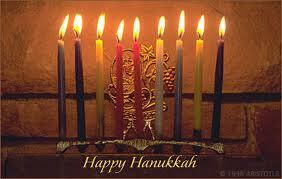 each evening, traditionally at sundown, one candle is lit on the hanukkah menorah (hanukkiah in hebrew). 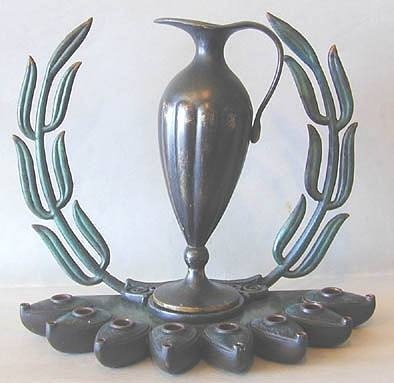 on the menorah there are 9 branches for candles, one for each night of hanukkah and the center candle is known as the shamash, or the helper candle that assists in lighting the rest of the candles. so….that’s the hanukkah basics…….next up, hanukkah traditions! the food! the games! the presents! This entry was posted in things i love <3, tidbits and tagged chanuka, chanukkah, hannukkah, hanukkah, menorah. Bookmark the permalink. Thank you so much and I’m so glad! Don’t ever hesitate to DM or email if you have a question, I love educating on the traditions and understand many people not knowing!